Do Your Front Hubs Work Loose? 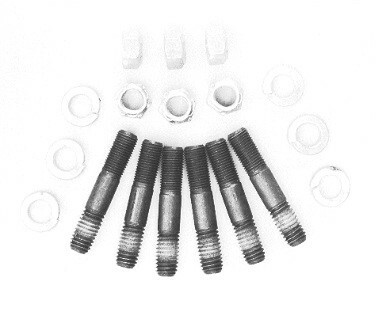 "Hub bolts" working loose is a common problem on vehicles equipped with locking hubs on the front axles. 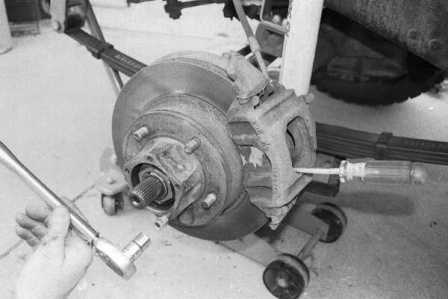 Although there are several causes, probably the most common is the use of a limited-slip or locker differential in the front axle. These differentials provide extra traction but add more stress to the front axle assembly. 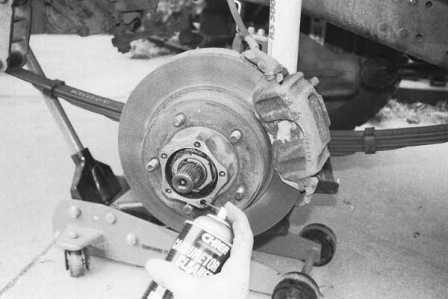 When hub bolts begin to work loose, the "slack" will provide enough movement to break the bolts, leaving part of the bolt in the wheel hub assembly. If that happens, the only way to extract the broken bolt from the hub assembly is by drilling and using an "easy-out tool" to remove the broken piece. This not an easy trail repair unless you carry a drill. Over the years I have seen many techniques used to keep hub bolts from working loose: everything from wiring the bolts like they do on aircraft to using special washers with a tab that can be bent up to prevent the bolts from working loose. Wiring the bolts takes too long and tabs break off the washers when removing the locking hub to service the front wheel bearings. Neither of these concepts works well. There is a solution. The best solution is installing bolt stubs in the hub assembly and securing the locking hubs with lock nuts. Finding all the right parts is not easy. Standard 2" studs have only a 5/16" non-threaded center section. On most applications this non-threaded center section will seat into the hub assembly leaving only threads exposed for seating the locking hub. From my experience the front locking hubs will still work loose if they are only seated on threads. The locking hub needs to be seated on the non-threaded portion of the stud for the best results. The kit we used had studs with an 11/16" non-threaded center section. Although standard lock nuts can be used, they need to be replaced each time you remove the locking hub. This is because the nylon-locking ring in the nut retains the thread grooves after it has been used and in fact the nylon can easily become oily. The solution is to use aircraft nuts. These locking nuts are all-metal and retain their locking ability for several uses and can easily be cleaned. ​On this project vehicle we used a kit from Tri-County Gear that had a stub with an 11/16" center section rather than the standard 5/15" non-threaded section. The kit also included aircraft locking nuts and a set of washers. Any type of washer can be used to keep the nut from scarring the locking hub. The kit came with locking washers so that is what we used. ​Remove the locking hub. 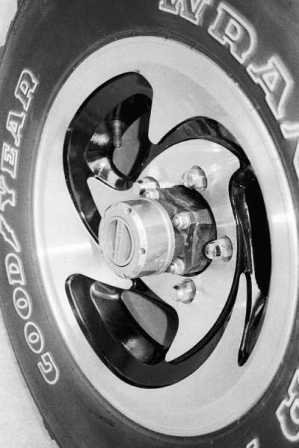 We also removed the wheel to provide more room to work and to keep the solvent from dripping on the aluminum rim. Rotate the wheel and spray the bottom holes with solvent. Then blow out each hole with an air hose to remove the dirt and dry out the hole. Working on the bottom holes will keep the solvent from running into the front wheel bearings. Continue rotating the wheel and cleaning the bottom holes until you are sure all of the holes are clean and dry. ​Using two wrenches, lock two regular nuts on the outer end of the stud. Clean the stud thoroughly and apply medium strength loctite-blue to the threads being screwed into the hub assembly (note: if the strongest Loctite-red is used, a heating torch will be needed to remove the studs). Tighten the stud to 45 foot pounds. Remove the two studs and repeat the procedure for each stud. (For those tool collectors among us there is a special tool for installing or removing studs). ​After installing each of the studs, check to be sure that a portion of the non-threaded center section is still showing. This is critical to the installation. 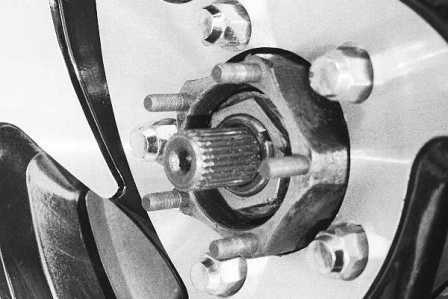 In order for the locking hub not to work loose, the locking hub must be seated on a non-threaded portion of the stud. ​Using aircraft locking nuts, bolt the locking hub to the hub assembly. Aircraft locking nuts are all metal and can be re-used when the front bearings are serviced.